The Atlantic City Convention Center hosted Wrestlemania IV and V, in 1988 and 1989. The 1988 event offered fans the championship final of a 14-man single-elimination competition for the WWF Heavyweight Championship. The evening opened with a wild 20-man Battle Royal. The headliners were Andre the Giant and Hulk Hogan, who had been best friends until Andre hired Bobby Heenan to be his new manager. Heenan and Hogan were mortal enemies. In Wrestlemania III, Hogan scoop-slammed the 500-pound Frenchman to retain his Heavyweight belt. They were scheduled to meet in the 9th match of Wrestlemania IV. The battle royal featured a number of iconic stars, including Hillbilly Jim, Bret Hart and George “The Animal” Steele. The last man standing was Bad News Brown, a former AAU judo champion under his given name of Allen Coage. Hart and Brown teamed up to eliminate the Junkyard Dog and then turned on each other and agreed to share the trophy, but Brown felled him with a Ghetto Blaster to win the match. When Brown received the trophy, the betrayed Hart attacked him from behind and destroyed it. 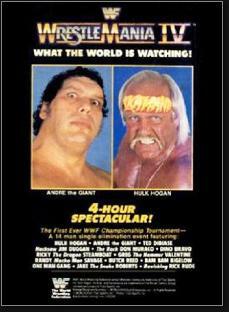 The match between Andre the Giant and Hulk Hogan devolved into a chair-swinging competition, earning both wrestlers disqualification from the tournament. That cleared the path for Ted DiBiase to reach the finals with a semifinal bye. Andre admitted to Bob Uecker in a backstage interview that he had conspired with DiBiase to eliminate Hogan by any means necessary; it was DiBiase who introduced the chair into the ring. He faced Macho Man Randy Savage, who was “exhausted” from his semifinal victory. DiBiase dominated the match, but while the referee was distracted, Hogan hit DiBiase with a chair. Savage executed a flying elbow drop from the top rope and pinned DiBiase to win. Savage, Hogan and Miss Elizabth—who was married to Savage—celebrated the stunning victory. Little did wrestling fans know that Miss Elizabeth would soon drive a wedge between the two champions! 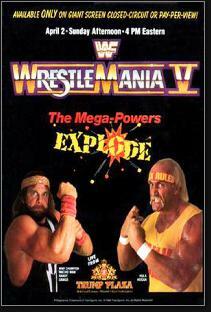 Wrestlemania V pitted Hogan against Savage for the WWF World Heavyweight Championship. In the year following Wrestlemania IV, the two had formalized their alliance by forming a dominant tag team called The Mega Powers. The friendship frayed, however, when Miss Elizabeth was filmed backstage tending to wounds suffered by Hogan when he was attacked after winning a January match. In a February tag team match, Savage was thrown from the ring and landed on Miss Elizabeth, knocking her out. Hogan carried her to safety, leaving his partner to fend for himself. They tussled afterwards backstage, and Savage challenged Hogan for the Heavyweight belt at Wrestlemania. The former friends met in the 14th and final match of the night. Hogan gained an early advantage, at one point chasing savage behind Miss Elizabeth who was positioned at ringside in a neutral corner. The competition spilled through the ropes a couple of times, as Savage clawed his way back into the match. At one point he devastated Hogan with Irish Whips in each of the four corners, but decided to pose for the crowd instead of finishing Hogan off. Hogan threw Savage out of the ring and tried to ram his head into the metal ring post, but Miss Elizabeth would not allow it. Savage slipped away while Hogan was distracted and rammed Hogan into the ring post. Elizabeth was ordered out of the arena at this point, and Savage appeared ready to finish Hogan off. But Hogan “hulked up” and turned the tables on Savage, beating him with a leg drop to win the WWF champion’s belt for the second time. Pro grappling’s Super Bowl returned to the Garden State in 2013 for Wrestlemania 29. Much had changed in 20-plus years, most notably the number of seats sold—upwards of 80,000 in addition to the robust pay-per-view audience. The Atlantic City events had been held in a 20,000-seat venue. The MetLife Staduim extravaganza featured three Main Event matches: The Undertaker vs. CM Punk (husband of New Jersey wrestling diva AJ Lee), former NCAA champion Brock Lesnar vs. Triple H, and The Rock (aka Dwayne Johnson) vs. John Cena. The Undertaker subdued CM Punk with a Tombstone to end a see-saw match and remain undefeated in 21 Wrestlemania appearances. Triple H defeated Lesnar in a no-holds-barred match that spilled out of the ring and concluded with a Pedigree pin on the metal steps. The Rock controlled the evening’s final match in the early going, but soon he and Cena began trading two-count holds and escapes, bringing the Meadowlands crowd to its feet. The Rock tried a Rock Bottom but Cena surprised him with a fireman’s-carry Attitude Adjustment (AA) to take his WWE title away. Copyright © 2017 Upper Case Editorial Services, LLC.